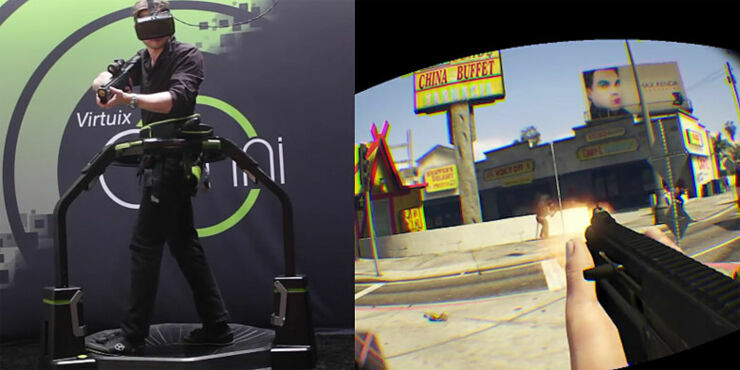 In terms of the burgeoning virtual reality scene in gaming, you've probably heard of the Oculus Rift headset which immerses gamers in a virtual environment—but you might not have come across the Virtuix Omni, an omni-directional treadmill to accompany VR headsets. The Virtuix Omni lets users walk, run, or canter like a horse if you want in a VR environment, allowing you to move around in 360 degrees without colliding with a wall or stepping on the cat. It's not cheap (it can be pre-ordered for $699) but the company behind it recently paired it with the Oculus Rift along with a gun controller, hooking it up to play Grand Theft Auto V.
The results are impressive and show you just how immersive gaming, and possibly films and art installations too, are going to get in the near future. I can't wait. Also, as a possible side-effect (especially with all that walking around in any of the GTA games), it does look like you might actually get some exercise whilst playing all of your favorite games, could this be the genesis of future joystick jocks? And, as you'll see from the video, casual violence inflicted on innocents gets to a whole new level of disturbing too.